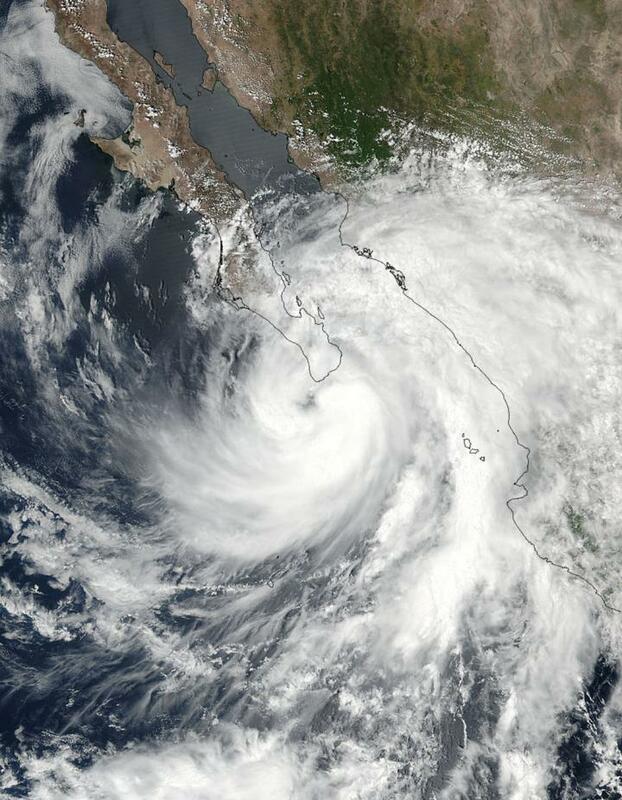 Hurricane Lidia's eye was visible in NASA satellite imagery as it approached Baja California, Mexico's southernmost tip. Hurricane Lidia was making landfall on the Baja on Sept. 1 at 5 a.m. PDT and continued to bring soaking rains to the region. NASA-NOAA's Suomi NPP satellite passed over Hurricane Lidia on Aug. 31 at 4:24 p.m. EDT (2024 UTC). The Visible Infrared Imaging Radiometer Suite (VIIRS) instrument aboard took a visible light picture of the storm when the eye was just southwest of the southern tip of Baja California. Thunderstorms in Lidia's eastern quadrant had already spread over mainland Mexico. Earlier in the day, NASA's Aqua satellite passed over Lidia and analyzed the storm in infrared light as it strengthened quickly. Infrared data provides temperature information and the highest, coldest cloud tops in tropical cyclones indicate where the strongest storms are located. NASA's AIRS instrument provides that critical temperature information. Lidia is a large system. Tropical-storm-force winds extend outward up to 195 miles (315 km), especially to the northeast and southeast of the center. This large system's most powerful thunderstorms surrounded the center of circulation. Some of the coldest cloud top temperatures exceeded minus 81 degrees Fahrenheit (minus 63 degrees Celsius). Storms with temperatures that cold are high in the troposphere and NASA research has shown they have the ability to generate heavy rain. On Sept. 1, the National Hurricane Center (NHC) said a Tropical Storm Warning was in effect for Baja California peninsula from San Jose de Las Palomas to Isla San Luis and for the mainland Mexico from Altata to Puerto Libertad. At 5 a.m. PDT (8 a.m. EDT/1200 UTC) on Sept. 1, the National Hurricane Center (NHC) said that the center of Lidia was moving onshore into Baja California Sur, Mexico and the heavy rains were continuing. The center of Tropical Storm Lidia was located near latitude 24.1 North, longitude 111.1 West. Lidia was moving toward the northwest near 8 mph (13 kph), and NHC said this motion with an increase in forward speed is expected through Saturday night, Sept.2. Maximum sustained winds are near 65 mph (100 kph) with higher gusts. Weakening is forecast during the next couple of days while Lidia interacts with the mountainous terrain of the Baja California peninsula. The estimated minimum central pressure is 988 millibars. As Lidia was moving over land on Sept. 1, infrared data showed that cloud top temperatures have been warming during the early morning hours. In addition NHC said that Lidia's convective pattern appears to be losing some organization as the storm interacts with the high terrain of Baja California Sur. Rainfall expected may reach up to a foot in some areas. Lidia is expected to produce total rain accumulations of 6 to 12 inches across the Mexican states of Baja California Sur into Baja California, Sinaloa, and the coastal section of Sonora, with isolated maximum amounts of 20 inches. These rains may cause life-threatening flash floods and mudslides. On the forecast track, the center of Lidia will move near or along the west coast of the Baja California peninsula through Saturday and then move west of the peninsula over the Pacific waters Saturday night when it is expected to become a remnant low pressure area. NHC noted that "some of the tropical moisture from Lidia may reach parts of the desert U.S. Southwest this holiday weekend, including southern California, southern Nevada, and southwestern Arizona.